Reviews from R'lyeh: Friday Filler: Action Cats! Action Cats! 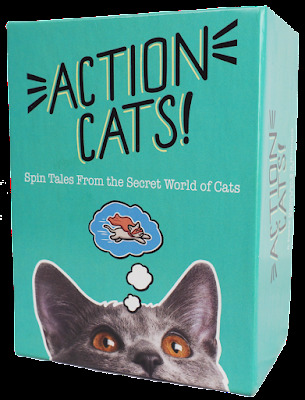 – Spin Tales From the Secret World of Cat is a game in which the players take it in turn to be the Judge and pose questions to which the other players will provide answers from which the Judge will chose the most appropriate, the funniest, or simply the one that she likes. Now that means that it sounds like Apples to Apples or like its more adult and better-known cousin, Cards Against Humanity. Now whilst Action Cats! employs similar mechanics it does not have the often in poor taste humour of Cards Against Humanity, but it does have theme where Apples to Apples does not. That theme is cats, specifically the cats we keep as pets—or is that the cats that keep us as pets?—and the things they get up to that we have no idea about. Published by Twogetherstudios.com following a successful Kickstarter campaign, Action Cats! is designed to be played by three to six humans, aged nine and up, in no more than thirty minutes. To play the game, each player receives four cards. The Judge—the first Judge being determined by the amount of cat hair they are covered in*—draws the top card from the deck and shows the photograph of the cat on the front to the other players. The Judge then introduces the cat and asks each of the other players to tell a story about this cat. They then combine the white section and the black section from two of their cards to create a complete sentence, and when it is their turn, they tell a short story about the Judge’s cat based on that sentence. Once everyone has presented their Action cat story, embellishing and adding flair as necessary, the Judge picks the one that she liked. The winner receives cat card that the Judge drew and that everyone told stories about. Then the next player becomes the Judge and a new cat is drawn and new stories told, and so on and so on, until of course, nine cats have been played. The player with the most cat cards as trophies is the winner. For example, as the Judge, Niamh introduces Trevor, a black and white cat with combination brush moustache and soul patch, who notably, is wearing a faux Viking helmet, complete with horns. She asks everyone to tell her something about Trevor. Alex explains that, “This cat is a heartbreaker… …And they’re always looking for a new challenge.” Louise says that, “This cat is a renowned expert on quantum mechanics… …On the sofa.” Dave explains that, “This cat makes the best biscuits in the county… …And has already sold the movie rights.” I say that, “This cat invented Dungeons & Dragons… And went directly to Gen Con.” Niamh replies, “Yeah… I can see Trevor having invested D&D. It’s the Viking helm.” She gives me Trevor as my trophy card. Action Cats! is of course, simple to play, but it adds a tweak or two to the format. The first is that it uses both sides of the cards—essentially the front of each card and its photograph serves as the question, whilst the back provides the answers. The second is it provides a space—literally a grey space—for the players to improvise. In some card games like Action Cats!, spaces are left blank, typically in the questions, for the players to fill in. In Action Cats! the space to improvise is on the cards that the players give as answers, but they are not left blank. Instead, they are already filled in with a noun or term, such as “viking raider”, “the future”, or “kittens”, which is printed in grey rather than black or white. A player is free to use these as given, of course, but he is equally free to change them to fit the story he is telling. For example, in the winning story above, “This cat invented Dungeons & Dragons… And went directly to Gen Con.”, “Dungeons & Dragons” was in grey, as was the word “bank”, which I replaced with Gen Con in order to tell a better story. This is a nice feature, one that allows for player improvisation when they want to, whilst still leaving something there for players less comfortable with doing so—and of course, it enhances the storytelling aspect of Action Cats! Physically, Action Cats! is nicely presented. The photographs of the cats are crisp and clear, the text on the cards is easy to read, and the rules are simple enough for the game to be pulled from the box and everyone to being playing in two minutes. The design of the answers on the back of the cards is obviously intended to make the players think about their stories as often the combination of the white section and black section on a card work better as an answer than does combining two cards. For example, “This cat was an infamous viking raider…” and “…But hates water.”. Which is a very good description of Trevor, but it never came up in play and nor can it because the answers are on the same card. If there is an issue with Action Cats!, it is that it is very American in its terminology. Thankfully, the grey text provides room for a player to come up with something else, to adapt as well as to improvise. Otherwise, Action Cats! 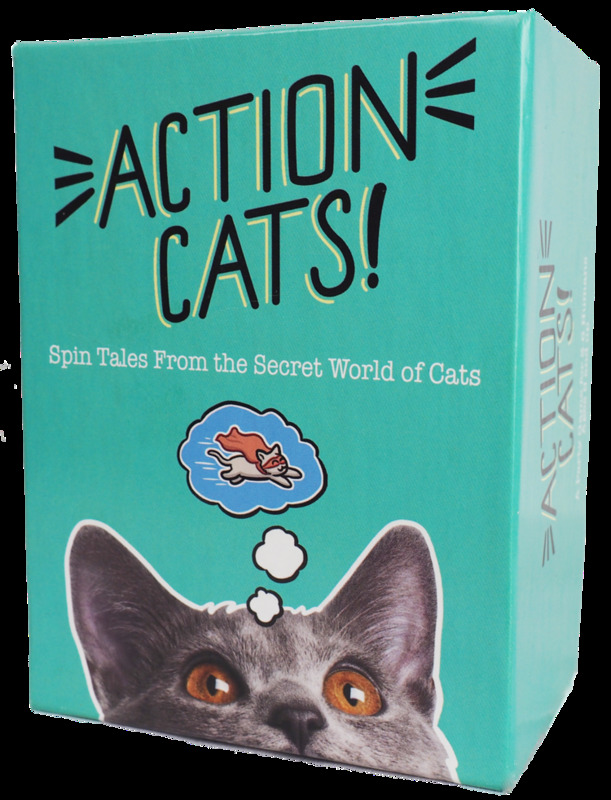 – Spin Tales From the Secret World of Cats is a fun, family game of feline fictions and fables with the right amount of pointers for both improvisation and simple storytelling.